What is shingles? Shingles is a viral infection that appears in the form of a streak of blisters mostly on the either side of the trunk of the body. The blisters caused by shingles are rashes that cause a lot of itching, irritation and pain. The virus that causes shingles is the varicella-zoster virus the same one that causes chickenpox. Once it has caused chickenpox the virus remains dormant in the body around brain and spinal cords’ nerve tissues. It reactivates after years to cause shingles which is not life threatening yet causes a lot of pain, aching and agony. The chances of developing shingles are greatly reduced by vaccination and if shingles treatment is started as soon as possible. Cuause is the root of shingles and that where we get start with "what is shingles". Shingles is caused by the same virus which causes chickenpox. Once your body has recovered from chickenpox, the virus can reach and remain inactive in the nerve tissues for years. The virus can become mobile again for any number of reasons and travel from the nervous system to the skin to cause shingles. Since shingles is most common in old people and those with a weakened immune system, the cause of reactivation of virus may be low immunity. 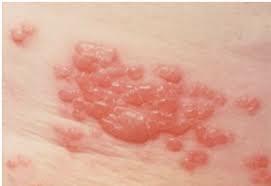 A person who has a shingles infection can pass on the varicella-zoster virus that causes shingles to other people who do not have immunization against the virus. The person who receives the virus would not get shingles rather he would get chickenpox which is threatening for some people. The shingles virus spread through the boils and blisters of shingles usually by direct physical contact. So you must avoid having physical touching with newborn babies, pregnant women and people with fragile immune system until your shingles sores and blisters have not healed. The pain you are experiencing is near your eye. In case the pain is because of shingles and you do not get treatment for it, the infection can cause permanent damage to your eyes. Your age is more than 65. At this age the chances of developing additional complications are greater. The blisters and sores cause a lot of pain and cover an extensive area of the body. Your immune system or the immune system of someone in your family is weak. This may be caused by immunosuppressant medications, cancer or an illness. You cannot have shingles without having chickenpox first. So you have the risk of developing shingles only if you have had chickenpox. The risk of developing shingles is greater if you are more than 50 years old. Stress or a sudden physical injury can also cause the chickenpox virus to get reactive and cause shingles. Cancer as well as treatment for cancer can put your body to a greater risk of developing a shingles infection. A weak immune system is the most probable cause of the varicella-zoster virus becoming active again to cause shingles. Illnesses like diabetes and HIV increase the risk. Steroids and other immunosuppressant medications can reduce your immunity and leave you more risk of having shingles. The shingles does not has any cure, though medication and treatment can reduce the duration of the disease and make sure that the complications do not occur. If you go to your physician with early symptoms of shingles your physician would recommend you antiviral and pain medication. Valacyclovir, acyclovir and famciclovir are some of the antiviral drugs prescribed by doctors. In order to reduce the pain, pain medicines like ibuprofen and aspirin are advised. Antibiotic creams are also recommended by doctors to apply to the area where shingles blisters have appeared. Antidepressant medicines. Amitriptyline is a good choice. Topical anesthetics. Benzocaine and lidoderm are anesthetics which can be applied directly to the skin to reduce the pain you are feeling. Anticonvulsant medicines. Pregabalin or gabapentin is helpful. In some patients, shingles gives rise to a secondary more critical condition. Post herpetic neuralgia is continuous long term pain that lasts for years. Treatment includes antidepressant drugs, opioids and anticonvulsants. In this condition, a rash occurs over a large portion of the body including heart, joints, pancreas and intestinal tract. In order to treat the condition antibiotics are advised to prevent infection and antiviral drugs to stop the virus from spreading. In this condition, a blister appears around the eye near the forehead, cheek and nose. The rash can result in permanent damage to the eye and you should immediately consult an ophthalmologist who might recommend antiviral drugs, rest and cool compresses. Keep the affected area lean and dry as it will reduce the chances of the blister developing any infection. Wear loose-fitting clothes to make sure that you feel relax and easy. Avoid topical (rub-on) antibiotics or adhesive dressings because they can reduce the speed with which your blisters are curing. Use a dressing that will not stick to the rash in case you want to cover up the blisters to make sure that the disease does not get passed on to others. Try calamine lotion as it is cool and diminishes the irritation and tingling. Use a cool compress for weeping blisters a number of times in a day. Cloth soaked in cold water can be used for the purpose. What Vaccines Help Prevent Shingles? The following vaccines can make sure that you do not have shingles. The varicella vaccine also known as varivax is a normal vaccine given along with other immunization vaccines during the childhood. The vaccine can be given to adults who have never had chickenpox. The vaccine reduces the intensity of chickenpox and shingles and reduces the chances of having complications after the infection. The varicella-zoster vaccine is an approved immunization vaccine for adults more than 50 years old. The vaccine reduces the risk of resulting in complicated conditions.